I woke up in the morning of my first full day in Fairbanks with a fever, a sore back, and a tight chest. The symptoms made my foggy mind briefly consider “pulmonary embolism,” but since it was more of a dull pain than a sharp pain, I pushed the fears out of my mind. I figured I was just sore from a rough night due to the endless sunlight and the somewhat uncomfortable bed. I made a token attempt to get going for the day but soon decided that more sleep was in order. When I finally got up a couple hours later, I noticed there was a voice message from an unfamiliar number on my cell phone. It was from a woman named Marcy who said that she had found something I had lost and was wondering if I wanted it back. Out of it as I was, I thought she said she had found my “black Sterno,” as in alcohol-gel cooking fuel. I couldn’t figure out what that meant, so I started digging through my belongings. I was trying to find something that was both missing and would have enough identifiable information to facilitate a return attempt. My computer and cameras were all accounted for, so I went to Sam and started looking through my other luggage. I was sitting in Sam’s passenger seat, digging through the glove box, when it struck me: I was missing my beloved black Moleskine notebook. It all made sense: the notebook had my name, phone number, and email address on the title page. I vaguely recalled putting the notebook on Sam’s roof the previous evening, but I didn’t remember taking it down again. And the voice message? 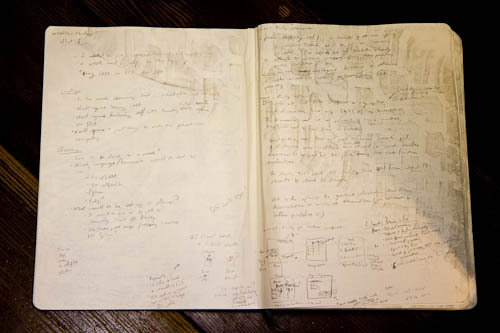 Marcy wasn’t saying “black Sterno,” she was saying “black steno,” as in notebook. Was I ever lucky that my notebook had been found and that somebody was trying to return it to me! Just one problem: Marcy hadn’t left a call-back number, and the number saved on my phone went to some sort of PBX system, so I had no way of getting in touch with her. I had to hope that she’d call back or email. She did both, and soon I was on my way to meet her on Fort Wainwright, the US Army base near Fairbanks. She returned the notebook to me and graciously refused to accept a reward. I thanked her profusely and went back to assess the condition of my notebook. It was clear that it had been run over by at least one car; the tire tracks professed as much. Despite that, everything was intact. The cover was in good shape, no pages were missing or torn, and the mechanical pencil was still inside (albeit broken). Yes, some of the pages were wrinkled, but that didn’t affect usability. A nice tread mark on my Moleskine notebook. I was impressed by the durability of my Moleskine notebook. For those keeping track, I had complained about the poor quality of my previous soft-cover Moleskine, so the one that eventually got run over was the replacement that the company sent to me. That newer one certainly seemed to hold up well. Marcy’s kindness touched me. To think that she actually stopped, retrieved my notebook, and went through the effort of getting it back to me was very moving. And the notebook itself? Well, it pulled through well enough that I intend to continue using it until it’s full. Someone really Awesome is looking out for you!! I remember your story about the other Moleskine notebook..I suppose the Moleskine company would appreciate this new story, tire track photo and all:) Hope you’re feeling better!